Highly personal in character, successful eclectic decor combines elements from different design periods and decorating styles in thoughtfully edited ways. It is all about limitless expression. In a style that’s defined by mixing and matching, you literally have the ability to create any design you can dream up. The sky’s the limit! This freedom raises many questions. How can you ensure that your design flows together? Will the design elements seem overwhelming rather than intentional? How will you know if a décor item doesn’t fit? 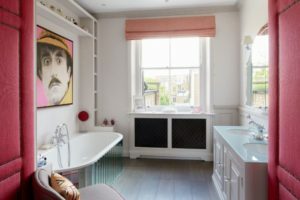 We would like to offer a few tips to help you get a handle on the rules you need to know to pull off a successful eclectic design project. Think of your room as a blank canvas. Since eclectic design melds details from many styles, it’s best to start with neutral backgrounds that later let you shift displays as the mood strikes. When you are dealing with the eclectic look, remember this style is often eye catching and a neutral background is necessary to relieve the eye. When we talk about neutral, you first think of paint colors such as white, gray, black, and tan. These are definitely the colors you should choose for your walls but also think natural materials for your flooring, countertops, and decor items. Woods, stone, and fibers have built-in texture and variation to keep the background from being boring. Symmetry is the use of mirror images and repetition to create balanced designs and design elements. Balance is a visual effect that makes designs look as if they are equally weighted on both sides of their vertical center. Use balance and symmetry to create a sense of structure. No matter what style you’re aiming for, balance and symmetry are important principles of design. Once again, though, they become even more critical to follow when there is so much visual stimulation in one area. Gestalt Psychology is an attempt to understand the laws behind the ability to acquire and maintain meaningful perceptions in an apparently chaotic world. According to Gestalt Psychology, our brains instinctively boil design down to it simplest form. Repeating identifiable patterns allow us to process the room’s visual information faster. As a result, we are more likely to find balanced spaces aesthetically pleasing. One color should serve as a unifying factor throughout your design. Let color serve as the great equalizer, pulling together the overall look. Whether your go-to color is an olive green or off-white, consistently return to it while decorating for a cohesive look. Keep in mind that eclectic design is not about getting rid of coordination altogether. Rather, it’s about making coordination a background note. To achieve a successful design, it’s critical to maintain a common thread throughout the space and, in eclectic spaces, color is the way to make it happen. For an added layer of behind-the-scenes structure, try to coordinate multiple colors within the room. Just remember your color theory basics and choose one shade as the dominant color while the others serve as accents. As you determine the decor you’ll incorporate into your eclectic design, don’t forget that the room is meant to be lived in. Let utility inform your decorations. It is quite daunting to be faced with an empty room and have to consider the colors and fabrics you’ll use to decorate it. Think of how you use a room to help pull it together. Consider baskets, bookshelves, trays, and card tables. These elements lend a cozy, lived-in atmosphere to your room. Do not be reserved. Eclectic style is characterized by a multitude of fabrics, patterns, and art items. Home accents like rugs, paintings, objects d’art, and throw pillows are convenient ways to bring a considered mismatch into any room. If you need help in achieving this project give our professional designers a call, they will be more than happy to help you. Looking to remodel your bathroom, kitchen, mudroom, basement, bar, or some other part of your home?… W.Stephens can help you! Initial Client consultation – The design process begins with a consultation at our showroom or in your home to obtain the necessary information needed to design your dream kitchen, bath, or space. Installation Meeting – We meet with the installers, prior to installation, to go over ALL the details. Our award winning designers collaboratively work together to create the perfect space for you.